The near-vertical headscarp of the slide put two nearby homes at risk, leading to permanent evacuation of these residences. Although this home was dislocated and destroyed by the slide, the resident escaped without injury. A GeoEngineers geologist sketches the geologic units exposed on the slide headscarp. 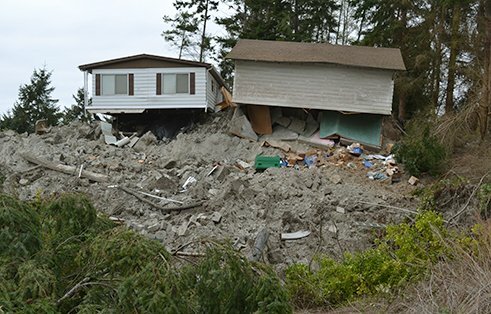 This home was dislocated about 150 feet as the slide mass rumbled into Admiralty Inlet. 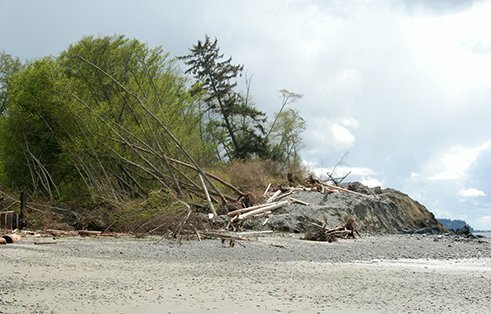 The toe of the landslide resulted in dramatic beach uplift, while carrying trees and debris as much as 250 feet beyond the pre-slide shoreline. Assisted Island County with emergency-response actions and long-term planning related to a major landslide. 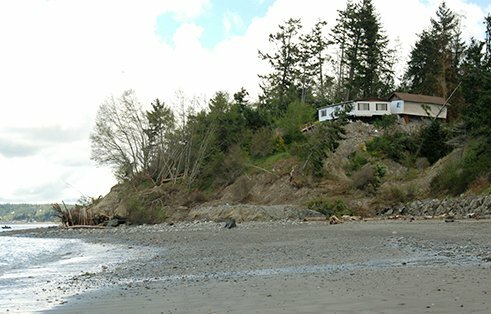 The Ledgewood Landslide that occurred on March 27, 2013 on the west side of Whidbey Island was one of the largest shoreline landslides in recorded Puget Sound history. The slide created a near-vertical headscarp at the crest of the slide area that was approximately 600 feet wide. The slope failure pushed debris approximately 250 feet into Admiralty Inlet, with an estimated 20 to 30 feet of uplift at the toe. The Ledgewood Landslide occurred within an older landslide complex approximately one mile long, and destroyed one residence, put several others at risk, and cut off access to approximately 14 homes. GeoEngineers provided a rapid site assessment the day of the slide, followed by an extensive, short-turnaround subsurface exploration and instrumentation program. We also worked with Island County Public Works (ICPW) and emergency personnel to determine appropriate steps to protect public safety. 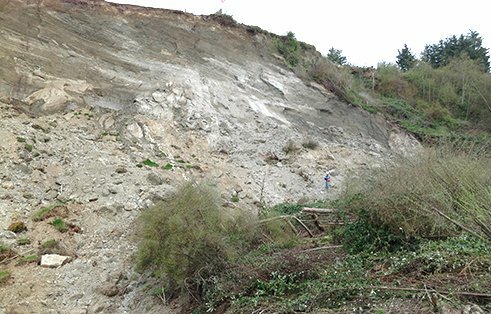 Within hours after the hillside collapsed, GeoEngineers visited the site with ICPW personnel and began a comprehensive geologic reconnaissance of the landslide area. In consultation with ICPW, we recommended which residences in the slide area should be temporarily or permanently abandoned and assessed when temporarily evacuated residents could return to their homes. We also completed a multi-phase geotechnical investigation of the landslide area and conducted stability analyses to evaluate risks to public safety and infrastructure in the vicinity of the slide. At one point during the field investigation phase, we had five drilling rigs and crews working simultaneously at the site to obtain critical subsurface information. GeoEngineers also contracted for additional LiDAR imagery of the slide area and directed the installation of instrumentation to monitor ground movements and subsurface water levels near the landslide mass. Landslide monitoring by ICPW staff and GeoEngineers’ data review indicates that little movement of the slide mass has occurred since the major slope failure occurred in March 2013. However, the very steep crest of the landslide has retreated episodically since the primary event and represents an ongoing hazard to structures and people in the area. 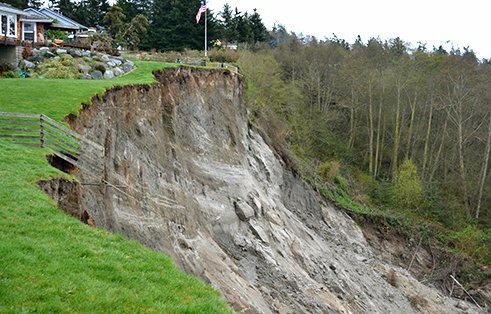 GeoEngineers continues to support ICPW by evaluating the landslide monitoring data and by considering options for improving roadway access to homes that were isolated by the slope failure. The landslide occurred suddenly and catastrophically during the early morning hours. No one was injured during the event, but the only roadway providing access to many homes was destroyed and several homes were deemed uninhabitable. GeoEngineers helped the county quickly assess and minimize the risks the slide posed to the surrounding community. "[This was] pretty much a herculean effort by GeoEngineers to get all this work coordinated and completed within the set timeframe. Our sincere thanks to the project team."